After thinking long and hard about it, I’ve decided that enough people know my venison burger recipe for me to let the secret out. After all, I was doing cookery demonstrations this summer at the Scottish Game Fair teaching a good few people how to cook them, so it’s time to share it with the rest of the world too. I sell these frozen at my farmers’ market – so please don’t tell my customers how easy they are to make. 2kg/4lbs fine venison mince i.e. forced through the finest blade. Place all the ingredients in a large bowl and mix with your hands. Really work the meat, so it’s like a paste. 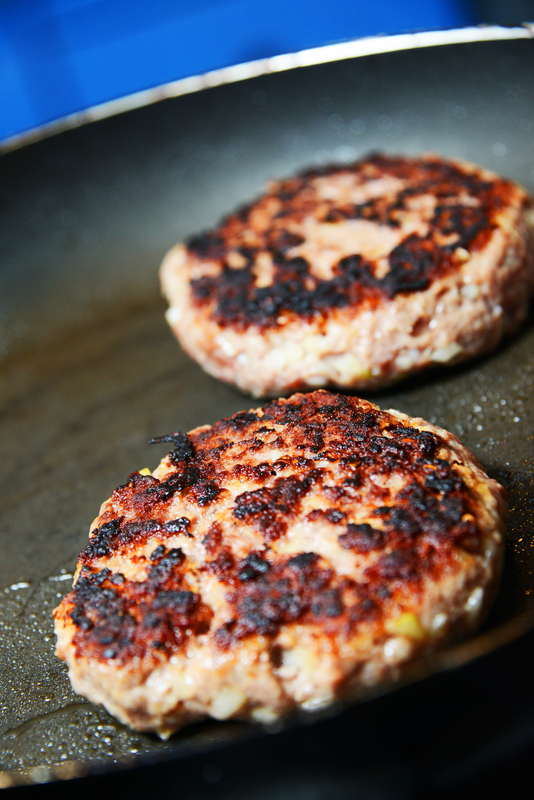 Then, if you’re lucky enough to have a burger press, use that to make your patties, and then cook or freeze. I keep on forgetting to bring my one back with me from the farm, so I often make handmade patties – and can confirm they’re just as delicious. I serve them with a good layer of cheese – Abigail fancied emmental this time, and she was bang on I think. I added a fried tomato that I cooked alongside the burgers after I ‘d turned them, and the served it on the side. Then add dressed salad and some chips. Now, I take my chips seriously. Abby is very anti the chip (I think it’s a girl thing), but I love them. They need to be thick cut, crisp, and lightly caramelized. Chips should always be deep-fried in a FRESH oil at high temperature – think rapeseed or sunflower. I like to cook them at around 130c/266F. Fry for around 20 minutes, then take out and allow to cool while you heat your oil to 190c/374F and cook for another 4 to 5 minutes. 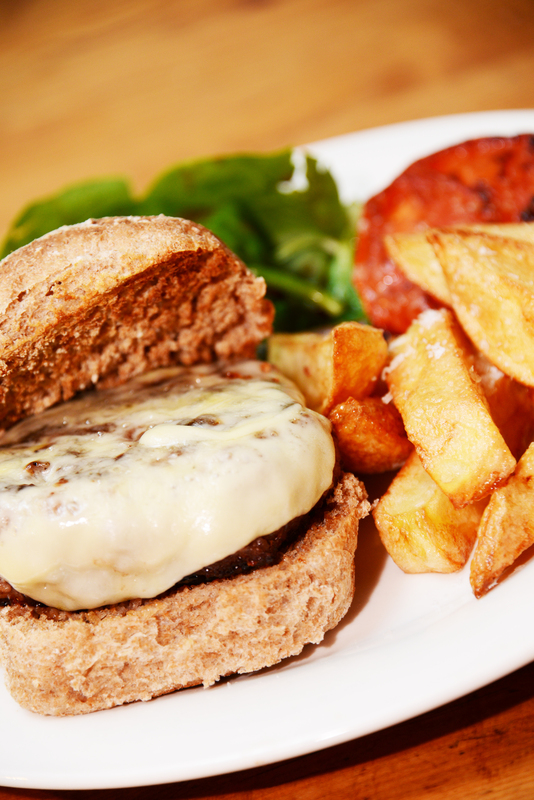 There is nothing like a juicy, freshly made burger for lunch.